Uriah (b. 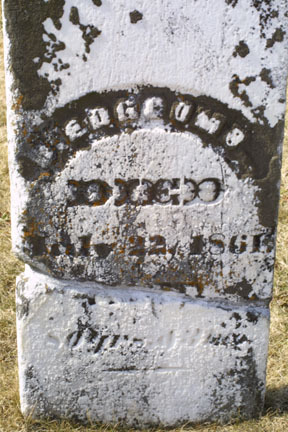 1781) was married to Elizabeth "Betsey" Doud (born 17921 and 11 years his junior) in Connecticut sometime c. 1808 to 1810.2 At this time, the Doud and Edgecomb families began the move to the western frontier. 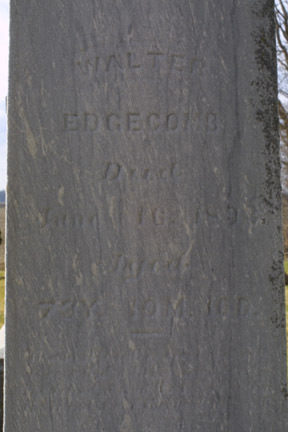 Uriah Edgecomb is listed in the 1810 census for Canton, Connecticut3 with a female the appropriate age to be Betsy and one child under 10 (presumably their eldest son, Uriah). We find Uriah selling land in Canton, Conn. in March of 18114 , and purchasing land in August in Preston, Chenango County, New York the same year5. This land was described as "part of lot number 42 to 43 in Township number fourteen". Uriah. b. in Conn. before 1810. According to his brother Marquis, he lived to adulthood9, but little else is known about him. Amy. 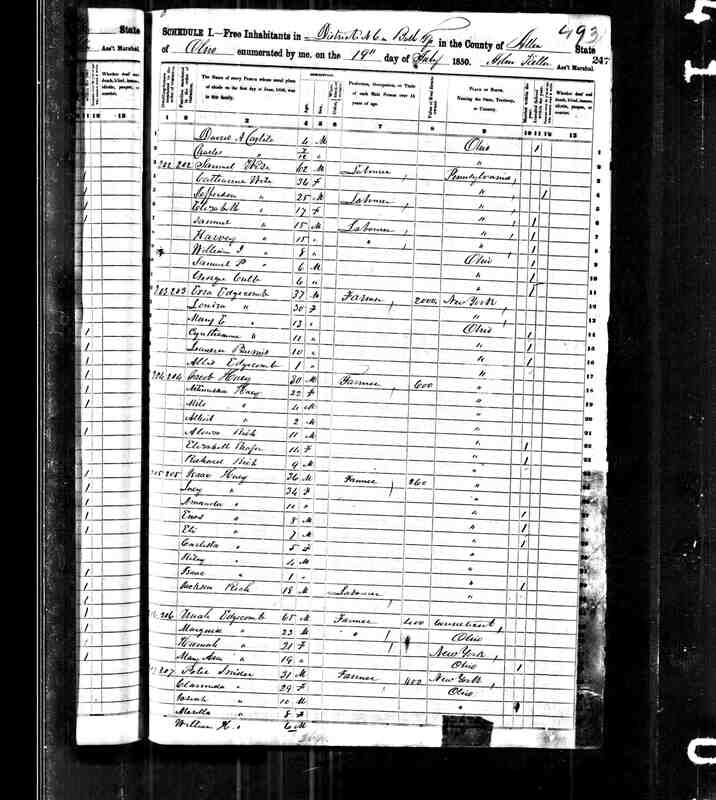 13 Sep 1827 in OH - 11 Dec 1850 in Allen Co., OH, m. J. P. Cowan16. Mary Ann (also known as Anna). 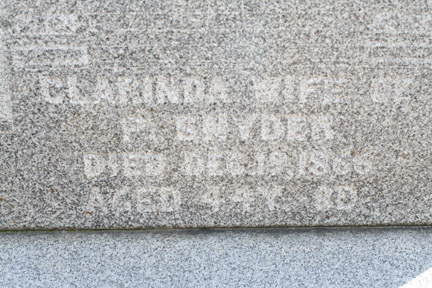 14 Jan 1830 in OH - 13 Apr 1893, m. 24 Dec 1850 in Allen Co., OH, Elisha C. Pangle. 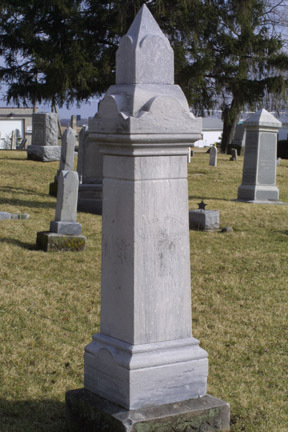 We don't know why the urge to move on was so strong - whether the soil in northeast Ohio was too poor or if Uriah just had itchy feet, but by 1832 the family was ready to move on again to Allen County in Northwestern Ohio. We also don't know why they chose to go there in particular, since Uriah and his family seem to have been the first of many Trumbull County folks to go there. In any case, Allen County was a wilderness at the time they moved. Although much of the rest of Ohio had been settled by whites much earlier, the northwest quarter of the state had been set aside in the Treaty of Greenville of 1795 as a "permanent" reserve for the Indians. It was not until 1817, when the white population of Ohio became overcome with greed for this Indian land, that they pushed the Indians onto three small reservations of twenty-five, ten, and forty square miles respectively in the Treaties of Maumee and St. Mary's. Although this act theoretically opened up the area to settlers, the settlement actually proceeded rather slowly. One reason for this was that much of the area around Allen County consisted of two great wetlands: the Great Black Swamp and the Hog Creek and Sciota Marshes. The soggy soil made farming impossible in many places and malaria (known at that time as "ague" and which was thought at the time to be caused by the vapors of the marsh) made life difficult there. The first white settlers in Allen County came in 1824 and started the Sugar Creek settlement in Bath Township on higher ground between the two swamps. To give an idea of how dense the wilderness was at that time, a second family lived at the Hog Creek settlement within a few miles of the Sugar Creek settlement for a year before the two parties became aware of each other's existence! On 12 Jul 1832, Uriah bought eighty acres of land located near the banks of the Sugar Creek in Bath Township22. 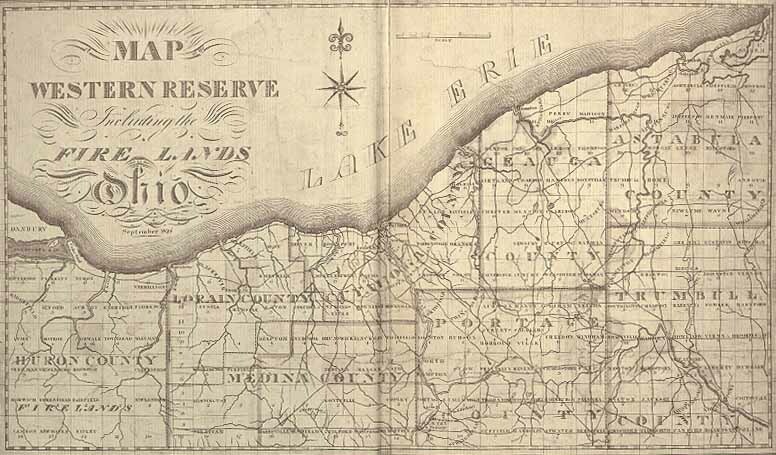 This land was an original grant from the State of Ohio and was a part of several tracts of land given by the federal government to the State of Ohio. The proceeds from the sale of the land were intended to be used to finance the building of the Miami-Erie Canal, which passed through the western part of Allen County and was a major factor in the development of the area after it opened in 1844. On those 80 acres the family made their home. 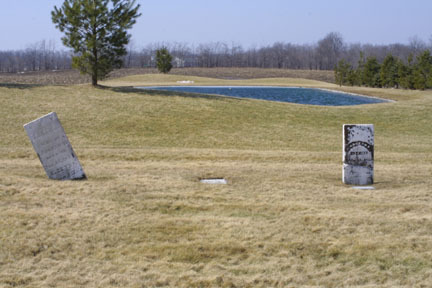 An Indian cemetery was located in the northwest corner of their farm and this may explain why they frequently saw the Shawnee Indians passing by on their way from the nearby Hog Creek reservation (now Shawnee Township). But the Indians were not to remain for long. Despite promises that the reservations were theirs forever, they were persuaded to sell them and relocate to Kansas. In the fall of 1832, "many surrendered themselves to despair, and plunged into a course of dissipation; others, with more regard to the legends of the tribe, collected their trophies, articles of the chase, domestic utensils, and even leveled the mounds of the burial grounds of the tribe. 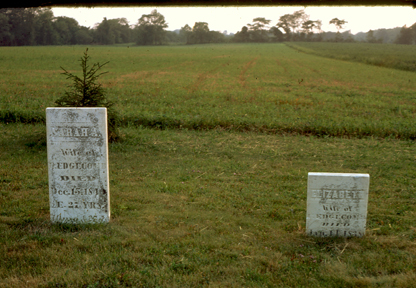 This accomplished, the sub-agents, Robb and Workman, gave the order to proceed on that long Western journey, and 700 members of the Shawnee family, with half that number of Senecas, moved toward the west...".23 Their wooded hunting grounds and sacred burial grounds were transformed into corn fields and their memory would only be evoked when some later resident plowed up one of their relics years later. 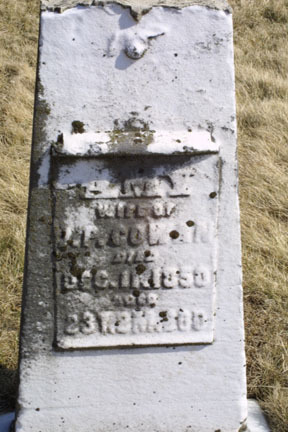 In about 1834, Betsey's sister Chloe and her husband, George Olmstead followed the Edgecombs from Trumbull County to Allen County.24 This was the beginning of a tide of Trumbull County folks who were among the first white settlers of the northwest corner of Bath Township. Included in this group was Uriah's nephew, Phineas Spencer Edgecomb (b. 5 Sep 1795, son of Uriah's brother, John) who lived out the rest of his life there. 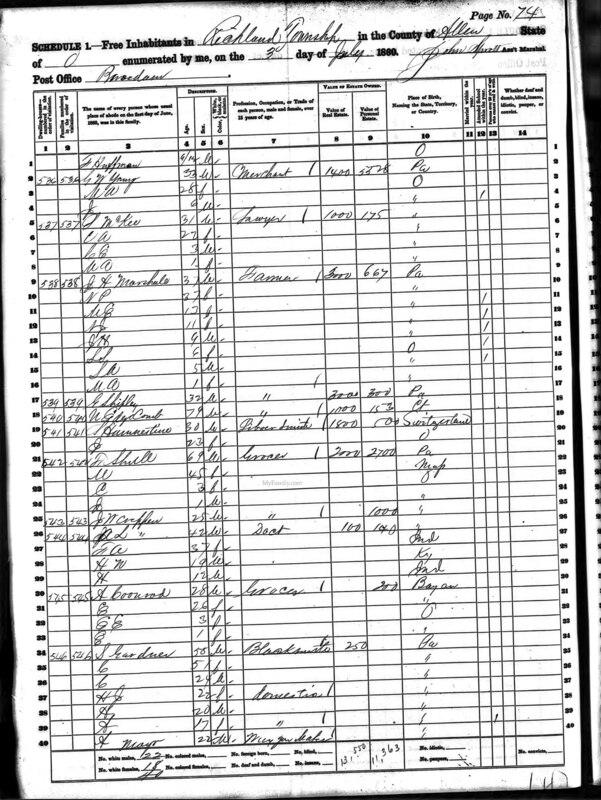 Uriah's older sons, Ezra and Lansil, bought land near his farm in 1833, and Robert did the same in 1835. The children of Uriah and Betsey began families of their own. For supplies and news, the families traveled to the log cabin village of Lima (now a city of 40 000), founded only a few years earlier in 1831. 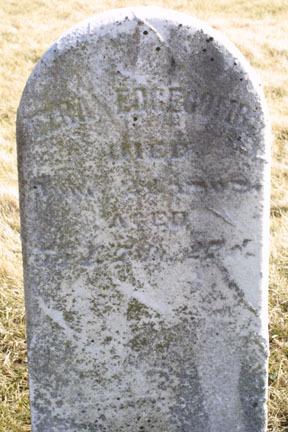 On 4 Apr 1835, Uriah and Elizabeth Edgecomb took out a mortgage on their farm for $250 with the Ohio Life Insurance and Trust Co.25 In the record of this transaction, Elizabeth signed with "her X mark", indicating that she was illiterate. 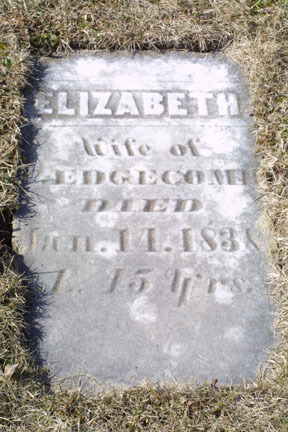 Tragedy struck the Edgecomb family when Betsey died on 11 Jan 1838. 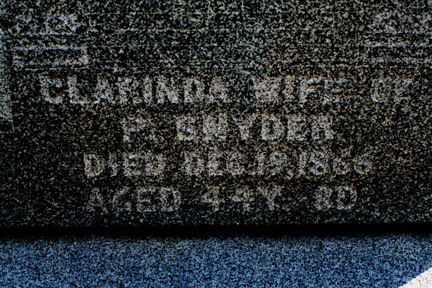 She was laid to rest in a small cemetery on a hilltop just north of their farm on what is now Wolfe Road. 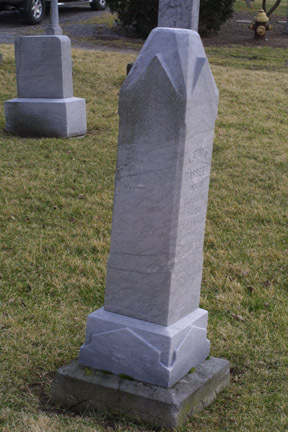 Other family members were later buried there, including Uriah, Ezra, Amy, and Phineas. 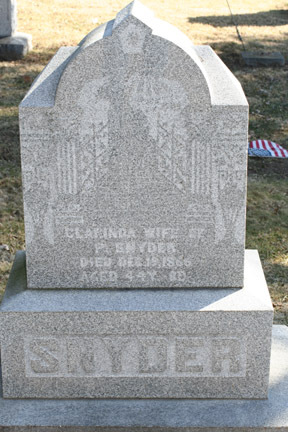 The weathered tombstones of these and other Trumbull County emigrants can still be seen there today. 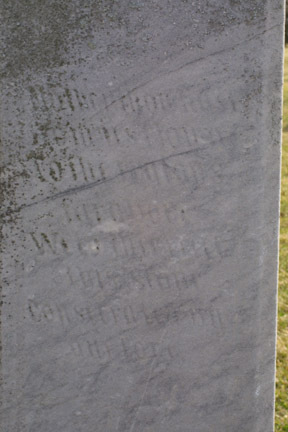 Another cemetery in the nearby village of Beaverdam contains the graves of Walter, Marquis, and Sarah, as well as Betsey Edgecomb's sister Chloe (Olmstead) Mowen. 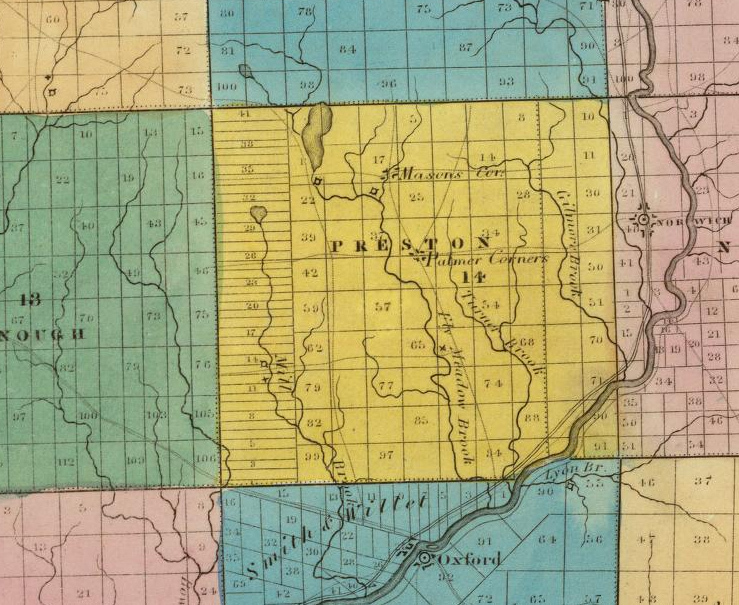 In 1845, Uriah bought the southeast quarter of section 11 (shown as the Hiram Prottsman farm on the 1880 map)27. 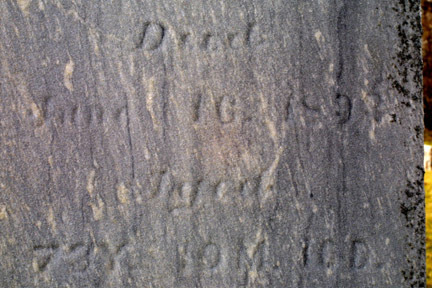 He lived there with his youngest son Marquis28 until 1857, when they moved just west of Beaverdam29. Both Uriah and Marquis bought land there in the late 1850's. 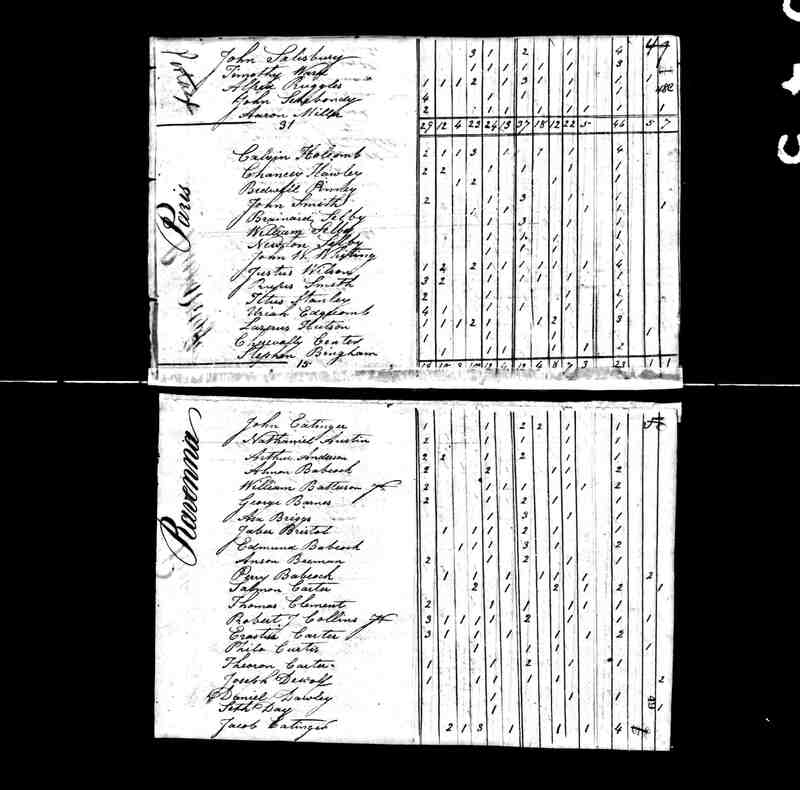 In the 1860 census, Uriah was listed living by himself in Richland Twp. in a separate household from Marquis.30 Uriah died on 22 Jul 186131, at Marquis' home. 2. 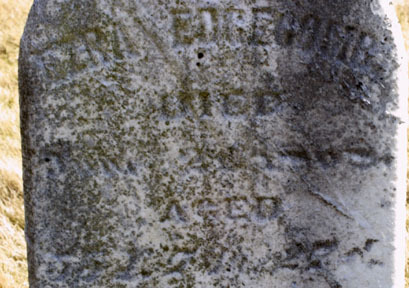 In 1808 Betsy would have been 16, so it is unlikely that she would have married before then. Based on the birth dates of their children, their first child could not have been born after 1810. 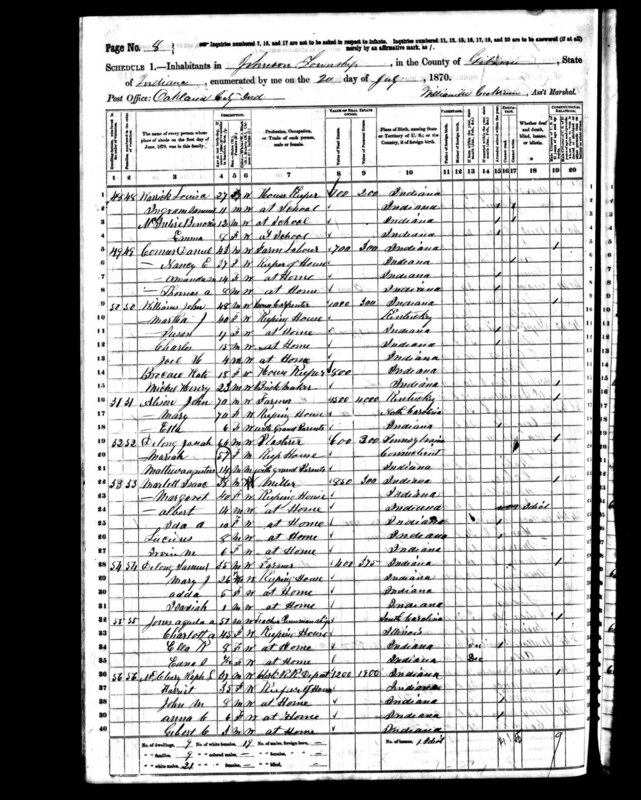 Census records also indicate that he was born in 1810 or earlier. 3. 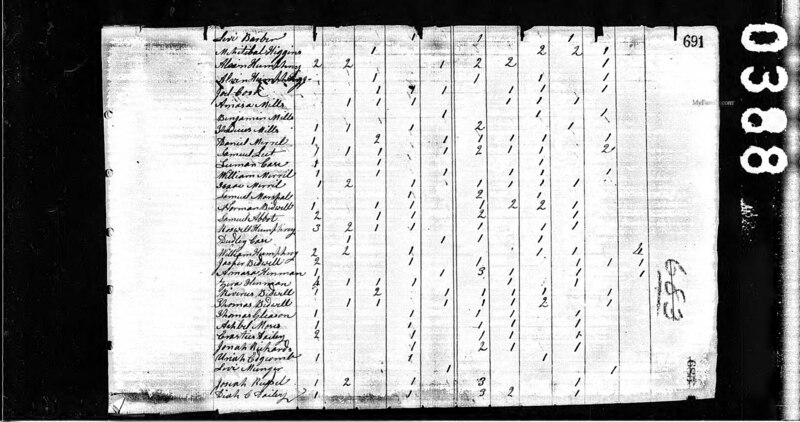 United States Census, 1810, Canton, Hartford Co., Connecticut, p. 691. 8. Letter from Inez Eagleton to Kathryn Snyder Geiser, 12 Jan 1979. 10a. 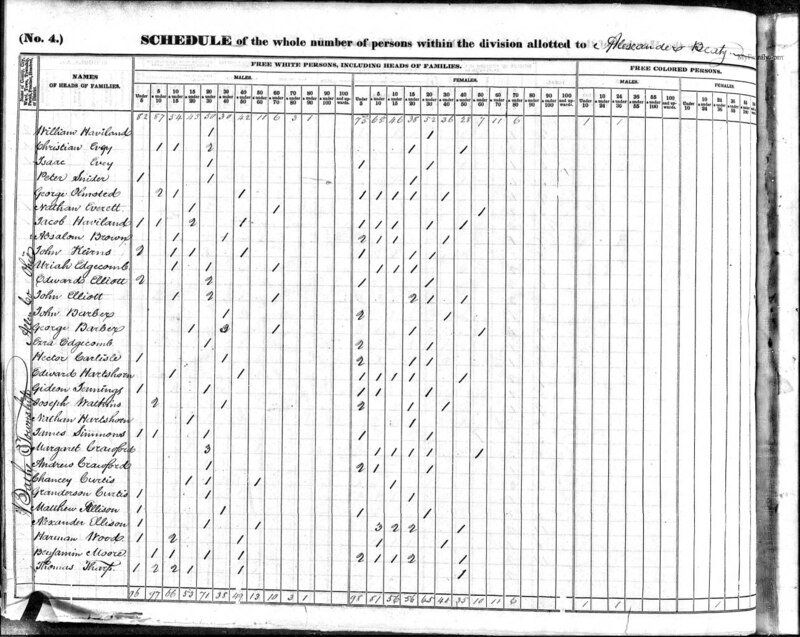 United States Census, 1850, Pigeon Twp., Vandenburgh Co., IN, p. 406.; United States Census, 1870, Indiana, Johnson, Gibson Co., IN, p. 439. 11. 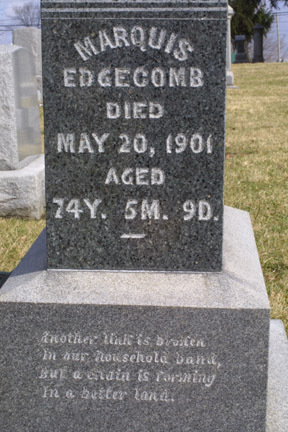 This birth date agrees with that given by his son in "History of the Edgecomb Family back as far as the 7th generation" [pg. 2] [handwritten original pg. 1 pg. 2 pg. 3] by Lansil Edgecomb (b. 1869), Pennville, IN 16 Sep 1938. 14. Birth date given in History of Allen, p.761. 17. 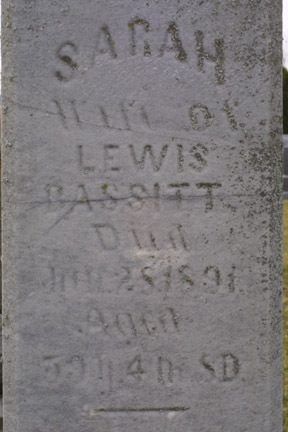 Tombstone inscription, old Beaverdam Cemetery, Richland Twp., Allen Co., OH "Sarah wife of Lewis Bassitt died Jan 28, 1891 aged 59 y 4 m 8 d". Dates agree with those from family Bible of Philo Bassett & papers, entries from 1875-1917, in possession of James H. Bassett. Monument inscription poem poem enhanced "Mother thou hast from us flown To the -- forever. -- --- --- ---- anthem"
23. History of Allen County, Ohio. Chicago: Warner, Beers & Co., 1885, p. 206. 24. Diary of Davis R. Doud, Gardner, Illinois, 1902. It may also have been that they came at the same time as Uriah and Betsey as suggested in Diary of Davis R. Doud, 31 Dec 1902, quoted in a letter from Inez L. Eagleton to Steve Bassett (Baskauf), 9 Sep 1981. 25. Mortgages of Allen Co., OH, Book B, p. 42. 26. Letter Eagleton Sep 1981 p.2 (see also pg 1) reports that Davis R. Doud, son of Alvah Doud and nephew of Betsey Edgecomb noted in his journal that he visited his first cousin Robert Edgecomb. Frank P. Edgecomb also mentioned in his reminiscences, 1944 Oct 29, recorded at Allen Co, OH Museum that "When I was a small boy a man named Doud came from Trumbull County and visited four or five days. He asked my father if he recalled some one back in Connecticut. 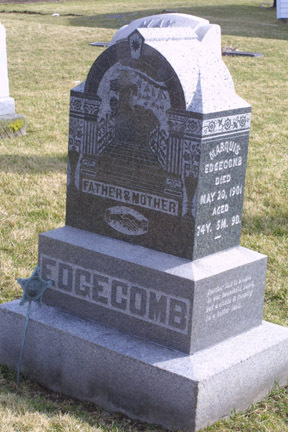 He was related to some of the Edgecomb family." 27. Deed: William and Rosetta Richardson to Uriah Edgecomb, Allen Co., OH Recorders office, Book L, p. 334. 6 Jan 1845. 29. History of Allen County, Ohio. Chicago: Warner, Beers & Co., 1885, p. 579. 30. 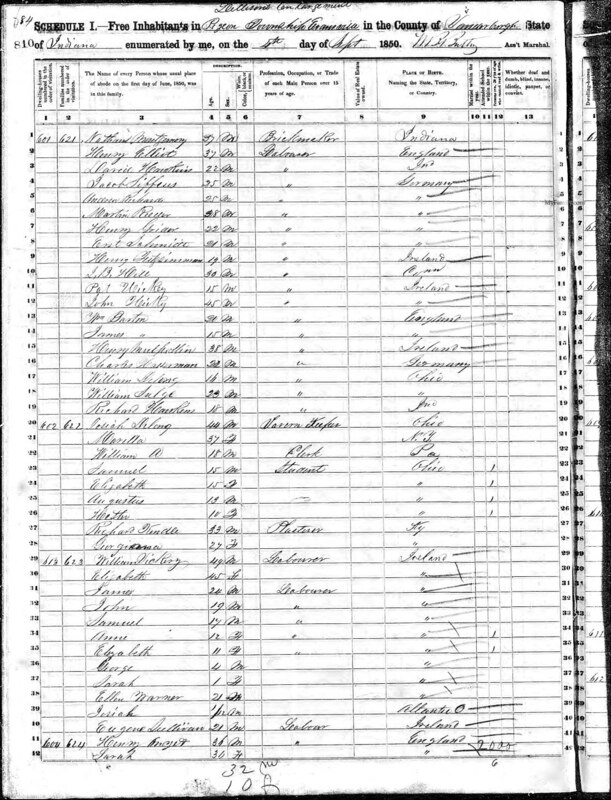 United States Census, 1860, Ohio, Allen County, Richland Township, p. 423, household 540.